0lson has been a leading manufacturer of scroll saw blades for more than 80 years, offering a full line of superior quality blades for most scrolling applications. 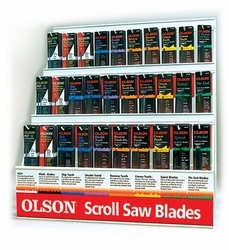 Olson blades are for use with scroll/jig saw machines sold by Delta, DeWalt, Dremel, Skil, Rockwell, Pro-Tech, Powermatic, RB Industries, Hegner, Sakura, Shopsmith, Excalibur, Rexon, Ryobi, Sears Craftsman, and Makita. (virtually all domestic and imported scroll saws). They can also be used in hand held fret and jewelers saw frames.